Our favorite track is “Songs of Love.” Véronneau’s voice is lovely as it floats over the guitar work of Avis and Rosenblatt. Joined by guest artist Etu Dieng on bass, Dave Kline on violin and Bruno Lucini on percussion and drums, the ensemble takes a deep look at love as a human condition. This original composition by the trio, has a well-constructed melody, form and lyrics. Both the violin and guitar soloing are pure rapturous joy. 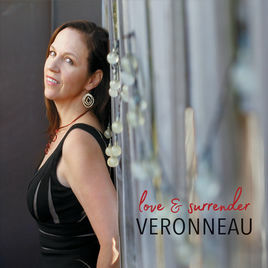 Véronneau’s vocal range is wide and her tone is smooth throughout as she clearly displays her fluency in effortless technique in classical, folk, blues, funk and latin. Elevating the songs connectivity to each genre. Veronneau the group is a season amalgamation of joyous music based in various ethnic backgrounds, all brought forth in beautiful performance that convey the beauty of each region to the listener. Their sound is infectious and heartwarming, a combination that is engaging and enlightening all in one. Love & Surrender is worth the price of admission, get yourself a ticket right away.